Your email marketing and social media marketing should carry your consistent branding through from your website and blog. Use a consistent color palette, font, logo, and wording. For instance, I use the phrase: “at the intersection of marketing and social media” everywhere I am — my Facebook fanpage, my Twitter, my blog, my email newsletter (BTW, if you’ve not subscribed, please do so here). 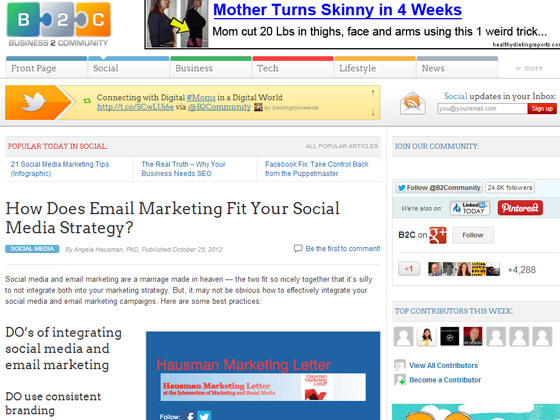 Notice, I use the same header as on my blog — Hausman Marketing Letter. And, if you check my Fanpage, you’ll see similar branding. Humans are visual animals and consistent branding helps them build a complete picture of your brand — brand image. By associating the great content across social media platforms with the image, you help them transfer their positive image of your brand in 1 platform with your brand in other platforms. Your email marketing should encourage readers to connect with your brand on other social platforms. Using social share buttons allows them to connect with you on Facebook or Twitter or Pinterest or Google+ — wherever you want them to see you. 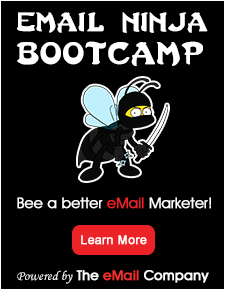 By the same token, you should include an email sign-up form on all your social platforms. I have 1 on my blog and another under the “SPECIAL OFFER” tab on my Facebook Fanpage.